I like the smell of tea so much that I buy candles and scented oils that smell like tea so that my room can smell like tea. Does this make me crazy? Probably. But that’s okay. I also like tea so much that I get frustrated in the summer because I can’t drink as much tea as I can during the winter. Iced PG Tips? That doesn’t sound like a good idea to me. On the other hand, iced mandarin orange spice tea? That does sound good to me. I guess there are different teas for summer and winter in my life. 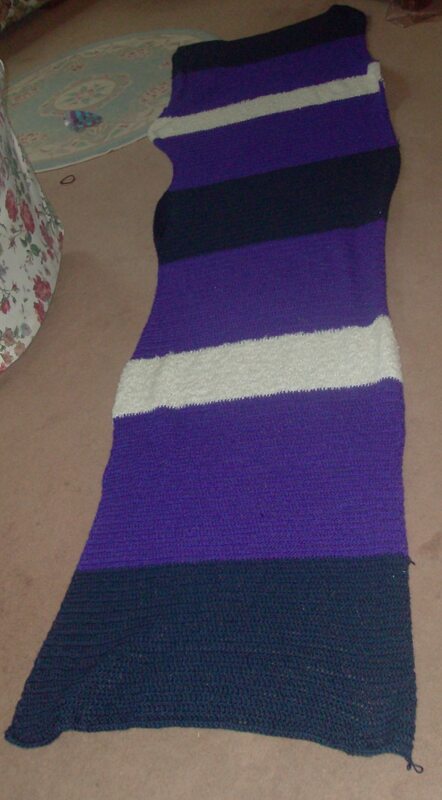 Back in October, I promised my friend, Nicole, that I would make her a blanket. We went to Michael’s and picked out the yarn. And I started crocheting. It was supposed to be a Christmas present. It was also supposed to be seven feet long. Well, I finished the blanket today. I know…it’s a little late for a Christmas present. And it’s not seven feet long. No, that is a ten-foot long blanket. But it’s done. And I hope that she likes it. Or so says Gershwin in Porgy and Bess. I saw P&B when Opera-Grand Rapids was doing their dress rehearsals during my finals week. I must say it’s a great show. And Summertime is probably the best song in the show. I’m now on summer vacation and am determined to use this summer to further my mind. I read The Chosen and The Promise by Chaim Potok (on the recommendation of my mother and the head of GVSU’s English Department) at the very beginning of May and loved both of them. I recommend them to every one. Read them. They are delightful. I took Resurrection by Leo Tolstoy out of the library yesterday and intend to read it very soon. I also want to read Crime and Punishment this summer as well as at least start on Dubliners by James Joyce. A dear friend owned a copy of both Dubliners and Portrait of the Artist as a Young Man in one volume and sold it to me. So I can try to make a dent in that one too. On the knitting side of things, I’m currently trying to make a doll sweater and a real person sweater. Both are pink-randomly. And pictures of both will probably appear as time passes. Additionally, I’m trying to finish a blanket I’m crocheting for a friend. My goal is to finish it by August. Here’s hoping! I do have quite a bit of time for reading and crafting since I don’t start working until June 14. So I’m trying to make the most of my free time while I have it. Last week, I went down to Pittsburgh, PA to visit a friend and I must say that it was a great trip, very relaxing and much needed. It was great to sit and drink tea or coffee and catch up on each other’s lives. We also worked on puzzles, something I need to do more oftenly. Later in the summer, my mom and I are heading to Stratford, Ontario to see The Tempest (staring Christopher Plummer!) and The Winter’s Tale. I’m really looking forward to that trip on many levels. And that’s how I’m beginning summer.